Eddie L. Long, senior pastor of New Birth Missionary Baptist Church, has gone to be with the ancestors. He was 63. New Birth Missionary Baptist Church celebrates the life and legacy of Bishop Eddie L. Long who is now spiritually healed and home with the Lord. Bishop Long, Senior Pastor of New Birth, transitioned from this life early Sunday morning after a gallant private fight with an aggressive form of cancer. As a man of God with unyielding faith, Bishop Long maintained his commitment to our Heavenly Father as he proclaimed that cancer would not kill his faith nor his spirit. First Lady Elder Vanessa Long, Bishop Long’s wife of 27 years offered the following. “I am confidant through my belief in God that my husband is now resting in a better place. Although, his transition leaves a void for those of us who loved him dearly, we can celebrate and be happy for him, knowing he’s at peace. Last week I expressed my concern about the health of Bishop Long. He seemed frail and clearly to be struggling with some kind of health issue, and while I respected his right to privacy (especially in light of the unrelenting nosiness of black church folks), I also reflected on the good that opening up about his health challenges might do for those dealing with similar issues. “That’s karma eating him inside out...or that package. #nosympathy,” said one. “The fact that new birth is still open with him as the pastor is ridiculous. Child abuser. Women are still bringing their boys to that church smh,” said another. The bishop was clearly a charismatic, flawed, divisive man. His aggressive, and at times confrontational, oratory was one of a kind. He did not preach in the traditional “three-points and hoop at the end” style of sermon that most black preachers use. He was sometimes given to expansive, stream-of-consciousness sermons that, in the hands of any other preacher, might come off as meandering. His sermons were so engaging that when he assumed the pastorate of New Birth in 1987, he had 300 members, but at its height, the church had more than 25,000 on its rolls. He even earned the honor of hosting the funeral of Coretta Scott King in 2006. His preaching ability played no small part in the growth of the ministry, but it was also his skills as an administrator that are of note. He managed over 100 volunteers, clergy and paid staff—a relatively new concept in many black churches until recently. There are some things one could admire in Long ... however, his patriarchy and homophobic theology are not among them. And in his book Deliver Me From Adam, the bishop expressed a longing for the days of Leave It to Beaver and Father Knows Best. “Unfortunately,” he once said, “most of the situation comedies project fractured families ... with openly gay family members and relationships.” He even went so far as to host a “Sexual Orientation and Reorientation Conference” for LGBTQ Christians at New Birth in 2005 and had a ministry entitled Out Of the Wilderness that tried to convert homosexuals into heterosexuals. Long’s homophobia and patriarchy are inexcusable. He has a legacy of problematic ideas that are by no means unique to him—he is the product of a black church that only recently began to wrestle holistically with oppressive ideologies adopted from a problematic reading of Biblical texts. Since his passing, some have taken to Twitter to claim that God gave him the cancer that killed him—that his death was divine justice. This kind of thinking is a kind of pre-Enlightenment theological slippery slope whereby we attribute death to divine dealings. If God killed Long, does he kill children who die of cancer? Did he kill Phife Dawg with diabetes? 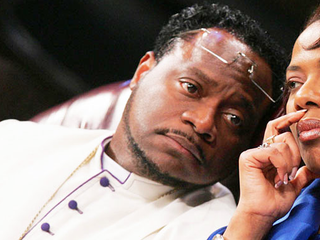 Bishop Eddie Long died of cancer; he is survived by his wife, Vanessa Long, four children and three grandchildren. His death was still abrupt, and his positive works are not negated by the controversy he created. His legacy is muddied by the distance of his word, but his death is not because of divine justice ... but because death is the common denominator of us all.